Are you wanting to know exactly how to wean a CABG patient from the mechanical ventilator? Well then you’re in luck because we’re going to break it down for you in this article. 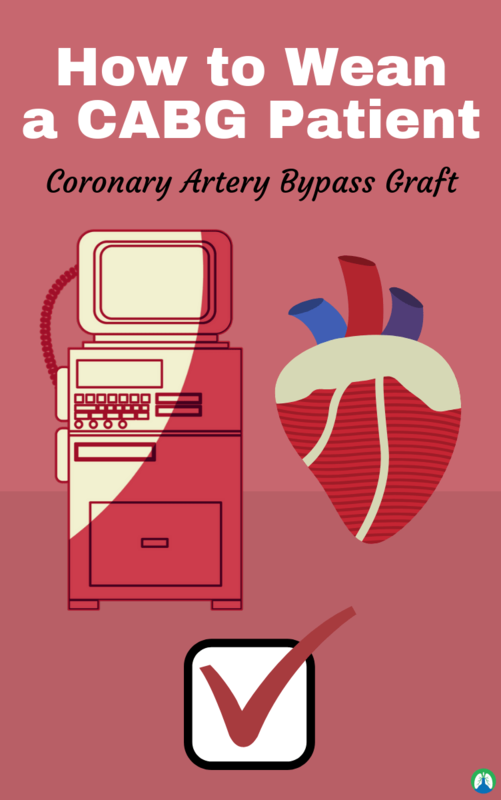 CABG stands for Coronary Artery Bypass Graft. It’s basically a type of surgery that improves the blood flow to the heart and is performed on patients with coronary artery disease. Coronary artery disease is caused by plaque in the bloodstream that, over time, causes the arteries to harden and narrow, which can cause chest pain and discomfort for the patient. A CABG is performed, basically, to provide a new and better path for the blood to travel to the heart, rather than through the blocked or narrowed coronary artery. A CABG is the most common type of open-heart surgery in the United States. Even though the success rate for this procedure is high, patients are still in very critical condition immediately after surgery. So it is our job as Respiratory Therapists to make sure the patient is weaned properly and in a timely manner to increase their chances of a full recovery and decreases the chances of acquiring VAP (ventilator-associated pneumonia). How to wean a CABG patient from the ventilator? Weaning a CABG patient from the ventilator is easy, just as long as you follow the right steps and protocol. First, when the patient arrives from surgery, the RT should evaluate the patient’s history and perform a physical assessment. Remember, the key to being able to wean the patient off the ventilator is assessing the patient’s muscle strength for breathing. 1. The PaCO2 should be kept within the normal range. Adjust the respiratory rate and tidal volume accordingly to maintain a minute ventilation of 5-12 L/min. 2. Measure and document the following ventilatory parameters: Vt, VC, NIF, and RR. Also, assess the patient for the following: bilateral hand grasps, the patient’s ability to lift their head from the pillow, and their ability to move their extremities. Upon obtaining these parameters from the ventilator, the patient must meet the following criteria before extubation: Minute ventilation < 12 L/min, FiO2 < 60%, Respiratory Rate < 28 breaths/min. 3. Once the patient is responsive and can perform a NIF > -20 cmH2O along with stable cardiac function, extubation may be considered. If the above criteria have not been met, you may place the patient on a T-piece and perform another ABG is 30 minutes post T-piece. The decision to extubate will be a collaborate effort between the Respiratory Therapist and nurse. RN’s and RRT’s can be friends, right? 4. If the patient requires an FiO2 > 60% or a PEEP > 5 to maintain a PaO2 of 80-100 mmHg and SaO2 > 92%, you should stop the weaning process and notify the physician. 5. If all required criteria are met, you may proceed to extubate the patient. Then place the patient on the same FiO2 that they were previously on, or whatever is takes to keep their SaO2 and PaO2 within the normal ranges. 6. If by chance, there is a change in cardiac or respiratory status, you should obtain STAT ABGs and notify the physician immediately. Now you know how to wean a CABG patient from the ventilator. You now know exactly what is a CABG which will help you properly treat your patients from now on. You can follow this easy step by step process and take all of the nervousness and guesswork out of the equation. Thanks for reading, happy weaning, and as always, breathe easy my friend.